Welcome back to Inspire Us Tuesdays # 26! Last week our party had 107 fantastic links! We are always amazed by all of the incredible things you have to share! It means so much to us that week after week you return and inspire us! We have a fun post to share with you that gives you the scoop on 15 Books about the Love of a Dog. If your reading list needs a little inspiration you won’t want to miss this post! Are you ready for the Inspire Us Tuesdays features!? We know your heart will go pitter patter for this Chocolate Cake With Strawberry Mousse Heart from Winnish. Winnish is making our tummies rumble again with these Heart Shaped Raspberry Whoppie Pies. Crafty Journal shared a great upcycle project! We adore this Valentine Holder from a Cereal Box. Simply Stacie shared this lovely Valentine’s Day Fudge that we wouldn’t mind sampling a nibble of. Seeing Sunshine shared these scrumptious Raspberry Shortbread Valentine Cookies that would make a perfect gift from the heart this Valentine’s Day! Crystal and Comp shared this easy recipe for Cake Mix Valentine Cookies that you will want to try! Views from the Ville shared White Chocolate Valentine Hearts that look mouthwatering! If you need an idea for a delectable dinner on Valentine’s Day, you won’t want to miss these Maple Salmon Rolls from Homegrown and Healthy. It is grandma Two Little Cavaliers Birthday this weekend and she is having a Sushi party so we have kind of been drooling over these all week thinking about all the yummy food that is going to be at the party. This post is especially for dog owners. Strawberries are in abundance in Valentine treats. You may wonder Can Dogs Have Strawberries? Our friend Sugar the Golden Retriever will give you the scoop! If you were featured in this week’s Inspire Us Tuesdays grab a button! *Link up to 3 posts. *Your recipes, crafts and household tips are welcome. Please no giveaways, etsy shops or links to anything you are selling. 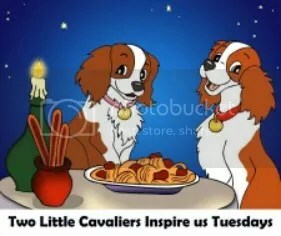 *We are looking for things that inspire you and will inspire our readers, fans, and friends at Inspire us Tuesdays. *You are welcome to link up anything that you find inspiring and share worthy. 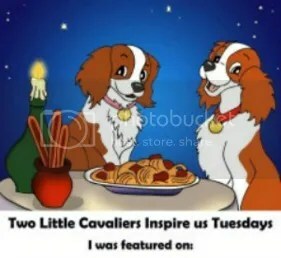 Please note that by linking up to Inspire Us Tuesdays you are granting us Davinia and Indiana the Two Little Cavaliers and our assistants (we don’t have thumbs so it gets hard to type), permission to feature your post on our social media accounts or on our Blog or in our newsletter if your share really inspires us. Speaking of our newsletter… We would love to send you a weekly party newsletter so you never forget to hop over and share something inspirational with us. If we share your post we will credit you and link back directing our readers, fans, followers, and their people to check out your blog. We can’t wait to see what you have to share with us this week! Don’t forget to visit the other bloggers as you are linking up. That is what makes a party so much fun! Oh and make sure to spread the word and tell your friends. You never know who is looking for a little inspiration or has something special they would like to share with others. and my Heart Shaped Raspberry Whoppie Pies. And thanks for hosting another party!! Christine recently posted..Are You A Hoarder? Thank you so much for sharing my recipe! And thank you for hosting these link ups! Thanks for hosting! And thank you for featuring my Valentine Holder from a Cereal Box. Have a wonderful day!